You know that Blue Dot that supposedly tells you where you are, and where you are going on Google Maps iPhone? It’s not to be trusted. Exhibit A: A few years ago outside a Minneapolis hotel, Alex and I followed this so-called navigational beacon for at least 30 minutes, only to realize we were walking up and down the same street in front of our hotel the whole time. Yes, we may have been under some sort of “influence,” but that does not make that dot any more accurate. Exhibit B: You’d think as two post-collegiate educated humans, we would realize we were on the wrong road to a giant Canadian National Park when we saw Pont Barre plastered on bright orange signs all over rickety bridges definitely not made for tonka trucks, or when we had to move fallen trees off the rocky dirt road, a road not suitable for any vehicle really, all the while encountering no other human souls. But the Blue Dot taunted us to go that way. So we went that way. And hey, maybe the Canadians did it different? Maybe they roughed it a little more than us Americans, and logs on main roads were normal? I mean, the Blue Dot must know something, right? Eventually we encountered a fork in the road that read Lac des Alliés both ways. We had reached the end of our wrong turn. But this road trip feeds my fascination with wrong turns. Aside from the extremely creepily abandoned cabin we passed that gave Christina enough eebie-jeebies to demand an immediate turnaround to the main road, it was pretty flipping spectacular. Later in the week we hiked over five hours and kayaked the same without encountering one single animal. But on that crappy, boulder-filled, fallen-tree covered, poor excuse for a road, we got a good look at Christina’s first porky porcupine shuffling off into the forest. And miles later, as I was waving my phone in the air, attempting to challenge the Blue Dot as Christina yodeled, “here moosey moosey!” out the window, her calls were answered. I turned the corner, and there stood a moose. A giant, giant moose. I immediately slammed on the brakes and looked at Christina. 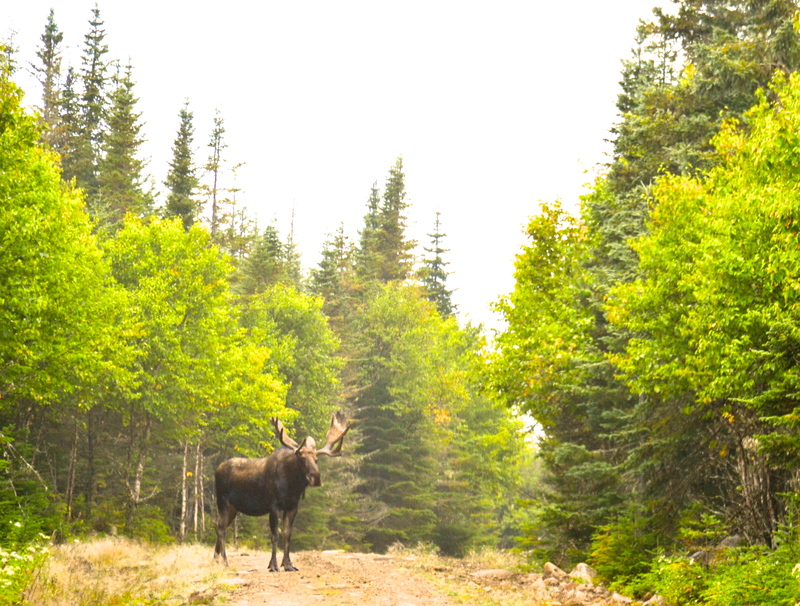 Our eyes wide, we looked back at the moose. I had thought I had seen a moose before. This was not a moose. If it was, he was The Father of All Moose. In my head, I am thinking it’s fall, it’s rutting season and he sees my big beautiful Blue as competition for his moosey ladies. He walks farther into the road. I recline my seat, as if to increase the distance he just gained. I’m not an idiot, though that Blue Dot constantly proves otherwise. My dad taught me all about The Forest Creatures. He is shooting photographs of brown bears and their cubs tearing apart fresh salmon from the rivers of Alaska at this very same moment. He might not have thought I was listening then, but I remembered. I knew that moose enough to be simultaneously awed and terrified. I slowly reached for my non-iPhone camera, but as anyone who has experienced Awesomeness in its true form, you know you can never truly capture it. We wait. The moose turns in a circle. Smacks his lips. Shakes his head at us, and walks back into the forest. He was obviously onto something. We weren’t on the entrance road to the park. We had entered the front door to his house. And I will be forever grateful he overlooked our intrusion. That would be Brown Bear sweetie, Brown Bear. Yep, sometimes GPS just means Getting Poor Signal, then you gotta figure it out, and figuring it out brought you the Moose and Porky. Good job! I knew that sounded too tame for you. Brown Bears. Noted and updated.